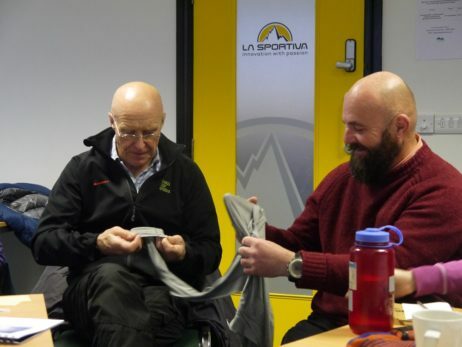 Developing a deeper understanding of polymers and textiles to increase appreciation of layering techniques in a range of activities including most outdoor activities. Latest trends are covered in our sections on emerging technologies which may look promising or even world beating as promoted but have yet to prove themselves. Finally we cover layering techniques in depth, for most outdoor activities from backpacking to climbing to skiing to biking whatever and whichever environment they occur in. Layering for camping and bivouacking are analogous to garment layering and help overall appreciation of Keeping Dry, Staying Warm. There are hundreds of Polymers, but we focus on the small number used in outdoor garments, for fibres, coatings and laminates and finishes. This provides an easy understandable route through what might be called ‘the polymer maze’, made more complex by branding of generic fibres sometimes different brands for the same thing in different continents. We explain the many clever combinations of polymers in fibres and fabrics. 8.1 Introducing the Key Polymers and Fibres. 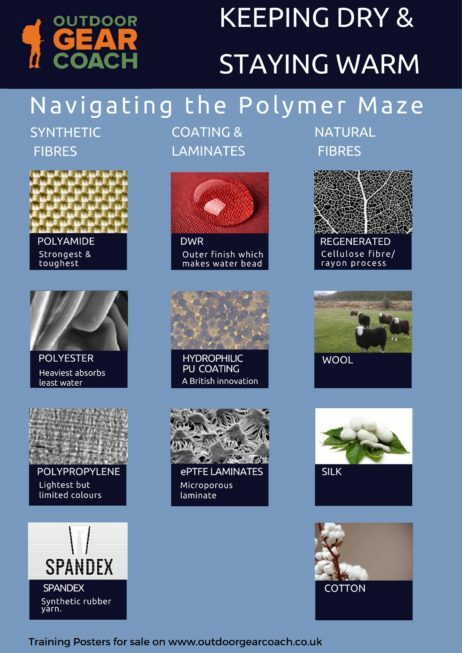 Focus on the key 11 polymers which form the basis of fibres, fabrics, coatings and laminates. How to read and ‘interpret’ the inner label which all garments must have by law. Poster also available. 8.2 Clever Fibre Combinations and emerging technologies. The base characteristics of some polymers/fibres described in 8.1 can be improved by combining them using textile processes, spinning, weaving, knitting. This chapter makes product descriptions much clearer. Poster also available. There are literally thousands of different fabrics used in garments and gear. But there are only 4 different types. 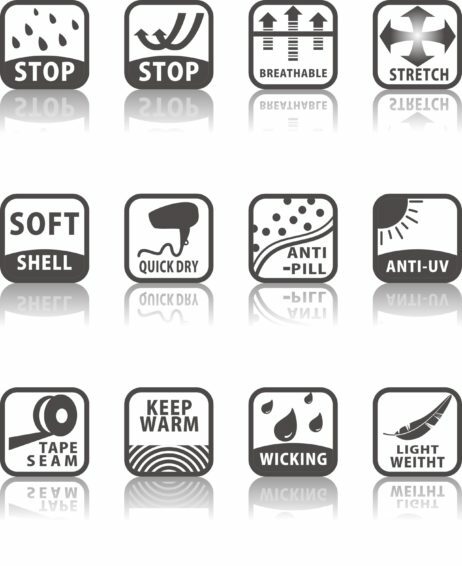 Having read the inner fibre/polymer label, then fabric type recognition gives you the ability to ‘read the product’. 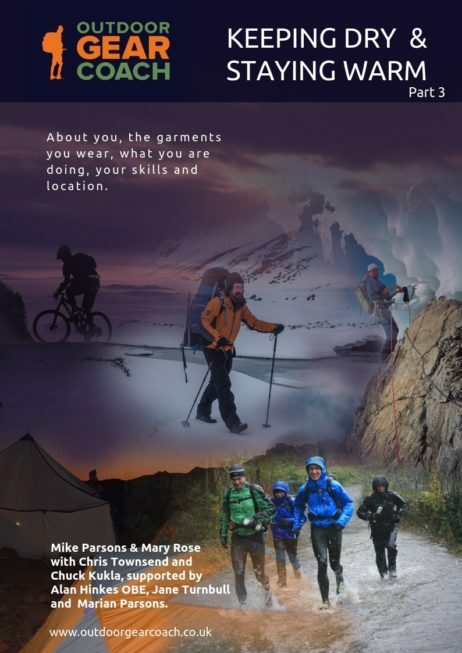 Chapter 10: Softshell, insulated and waterproof garment overviews. is hard to define. We look at the origins and provide an analysis of their basic function. and their place in the layering system. Advice on making the best selection from of the vast range of different types now available. Much has been written about down insulation but much less about synthetic. We bring you up to date on the rapidly improving synthetic insulation types. A technical overview and historical innovation timeline of all 6 types of waterproof garments. Lots of ‘emerging technologies’ here. Chapter 11: Layering for sleeping, (is analogous to garment layering). 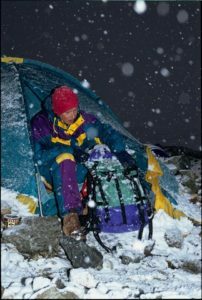 Staying warm at night when you are sleeping, or trying to at least, is about controlling the environment around you with tent or tarp, sleeping bag, and any clothing you choose to wear; plus the sleeping pad options beneath you. Choosing the right combination of all these is complex and needs experience. Thinking of this as ‘layering for camping’ helps if you are aware of clothing layering principles. Chapter 12: Layering for Bivouacking, is analogous to garment layering. Our approach here is to record the little known stories of the innovation of bivouac gear. The use of all these products can be more effective if we think of them in terms of layering, each layer having a specific function and insulation capability as clothing layers. From George Finch’s invention of the first down jacket for Everest 1922 and in the mid 1930s, Pierre Allain (of the PA boots) developed a complete bivouac system. This comprised sleeping mat, down jacket, short sleeping bag (called pied d’elefant) and a long waterproof jacket coming down over everything and below the knees when worn as a jacket. This was known as a ‘cagoule’ and became standard British wet weather wear for decades. Bothy bags and portaledges are also covered. Alpinism, road and mountain bike and high altitude issues. Dealing with clothing layers and toileting is often only discussed in expedition camp when all are facing the same reality. We spell it out for the first time and advise on the right zips in the appropriate layers.